The hoard of negative press surrounding Woody Allen’s new (and first) television series, Crisis in Six Scenes, just might stem from the public’s opinion about Mr Allen, following his daughter’s renewed allegations against him, and may, unfortunately, have nothing to do with the show itself. The only reason I say this, knowing full well that it might be a long shot, is because the series is not as bad as most people make it out to be and yet most criticise Mr Allen for having lost his touch. The word is that Amazon paid Mr Allen and gave him free rein, never asking him to report on the progress, saying, instead, that he should just get it done. And he agreed, because why not? This has led to some speculation that the veteran writer-director took the project far too lightly. To add fuel to the fire, the series does not stand up to his excellent films, and the set design for the 60s, when Crisis in Six Scenes is set, is painterly and made the mistake of reminding me of one of my favourite television shows ever, Mad Men, because the AMC show did a much better work with its production design and Crisis in Six Scenes is no match for it. Nor is it a match for any of the starry half-hour shows running on TV right now. But who watches Woody Allen for the latest in stunt tech, CGI and props? Glitzy design and micromanaged, intertwining plot threads were never something to look for (or look forward to) in any of Mr Allen’s works. It all always came down to the script and his characteristic one-liners that, for nearly everyone who discovered Mr Allen’s work over the past decades, made us enjoy it. His films were never about the visuals and non-linear tales that define ‘blockbusters’ these days; instead all his films are about escaping, about letting yourself go in his on-screen world (sometimes a comically sensible one, but almost always weirdly loveable one) and enjoying the lighter side of life, of what can be, and of all the humour, all the pointlessness and all the pettiness of our existence. And if you do all that, Crisis in Six Scenes is quite like what you always imagined a Woody Allen television series would be: aloof, funny, subtly magnetic in its charm, and ultimately an acquired taste1. 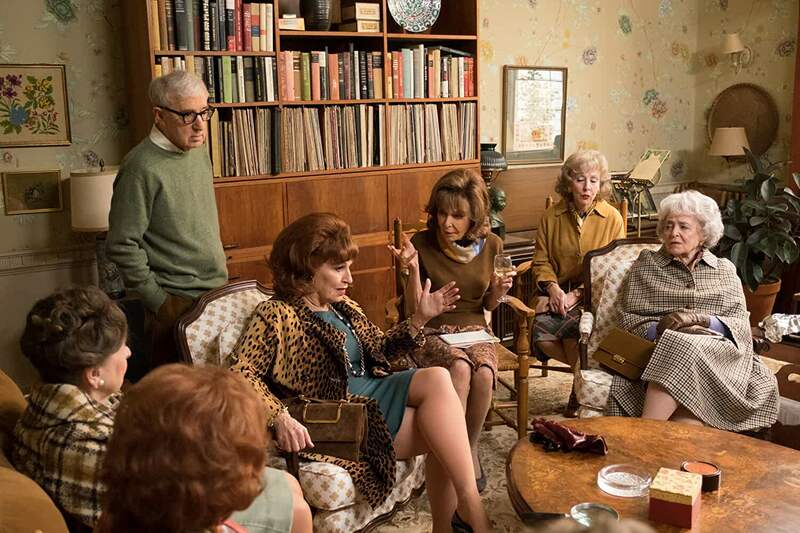 The show is about a bumbling old man, Sidney Munsinger (Woody Allen), who, in his ‘golden years’, has been trying in vain to become a good writer like J.D. Salinger (thanks to whom he even adds a middle initial, J, to his name). He was, in his youth, a fairly good copywriter for an advertising agency. His wife is a marriage counsellor (Elaine May) and runs a bookclub with her old-lady friends. Living with them is a friend’s son, Alan (John Magaro), engaged to be married to Ellie (Rachel Brosnahan) whom, Sidney reminds us repeatedly, he introduced to Allen. All of this is in the backdrop of the sixties, with civil rights debates and lots of talk of the war. Enter Lennie Dale (Miley Cyrus) the hippie, pacifist, anarchist daughter of one of Sidney’s wife’s distant acquaintances, who breaks into the Munsinger house after escaping a prison and shooting a guard, and, in the process, plastering herself all over the news. A minor, self-proclaimed revolutionary of sorts, her presence and the debate against ‘passive resistance’ that she brings to the table turns the others’ lives inside-out. Not incredible, but almost as fun as a Woody Allen film. The premise is great and would have made for a deep, dark show, except Mr Allen takes it a different route, complete with rooftop antics. By the end, everyone but Sidney and Ellie seem to agree with Lennie to various degrees, with everyone reading and quoting revolutionaries and communists from Mao to Che, including the many old timers in the book club (pictured above). Unfortunately, the show lets slip its golden chance to actually slide some meaningful ideas into the many disagreements Lennie and Sidney have. While Crisis in Six Scenes is a comedy, it does not have to shun proper debates altogether; in fact, comedy is the perfect medium to put out thoughtful statements in. Nonetheless, the six-episode long series (I have no idea if Amazon will be queueing it for a second season) feels well put-together, beautifully constructed, and yet gets nowhere. In the end, you are left wanting a little more of the show, not because you hate that it ended, but because it ended rather awkwardly; there was not enough debate, not enough witty gags, and not enough character exploration. Crisis in Six Scenes is good and will not be a waste of your time, but it sadly feels like an obligatory Woody Allen television series coming fifty-years too late. But the thirty-minute episodes are still entertaining and the story ties itself together particularly well if you use one little trick when you tune in: binge watch it.